I'm not one to have a lot of pastels in her closet, but lately, I just can't seem to get enough. It started with ice blue from White House Black Market, continued with Everlane, and now Mott & Bow and Talbots are making me blush. It may be because I am completely OVER winter and want spring in any way, even if it's in my wardrobe. Yesterday it was in the high 50s, perfect weather for a springy blush pink trench coat from Talbots and bare ankles! Mott & Bow invited me to try out their cashmere; they have a crewneck and a v-neck. Available in four neutrals and blush pink, I decided to go with their “Heavenly Pink” in a v-neck. This color is so pretty, it's like a sophisticated version of baby pink. The cashmere is lightweight but not cheap; it is slightly transparent (the level where you can see the color of your dark jeans through it when untucked but you can't see your bra or your belly button). The XL fits pretty standard to mall brands; I chose it for a more relaxed casual fit but a L would be good if you want to wear it for work or layered under blazers. Since Mott & Bow increased their size range on some of the styles of their jeans I hope they do the same with their sweaters. It's really hard to find nice cashmere sweaters in larger sizes, especially at reasonable prices! And of course after yesterday's post we have to talk about these jeans! You may recall I got these jeans when I visited Trunk Club last spring. I never paid so much for a pair of jeans, but they were pretty perfect. Also Trunk Club provides free alterations so they were hemmed to the perfect length that works with heels and flats. 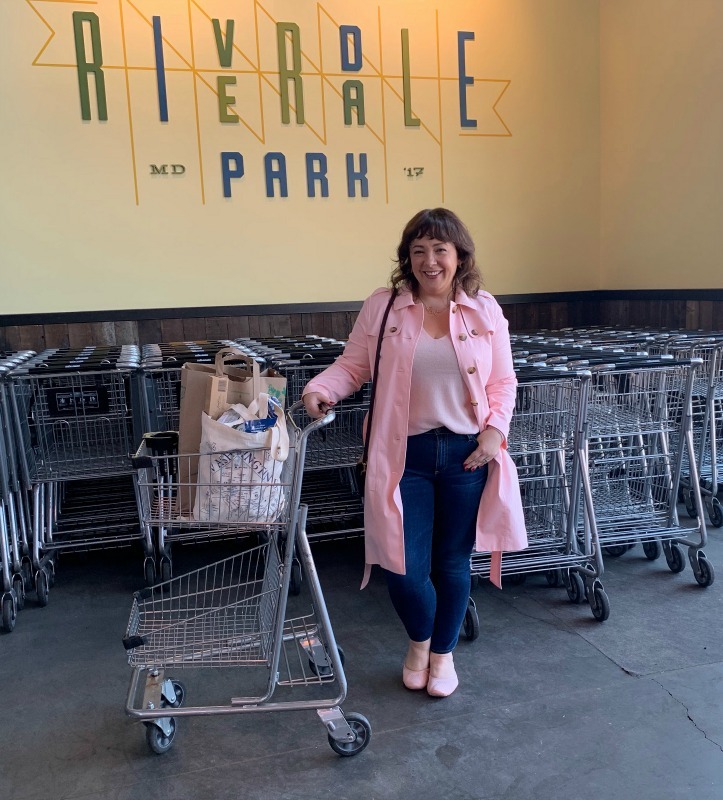 In fact, keeping it real here I am at Whole Foods in the same look but with my LISSOM flats (read my LISSOM flats review). But these jeans continue to be one of my favorites. I'm writing this at 9pm still wearing them and I put them on at 10am. They really have molded to fit my body and the color is pretty good. 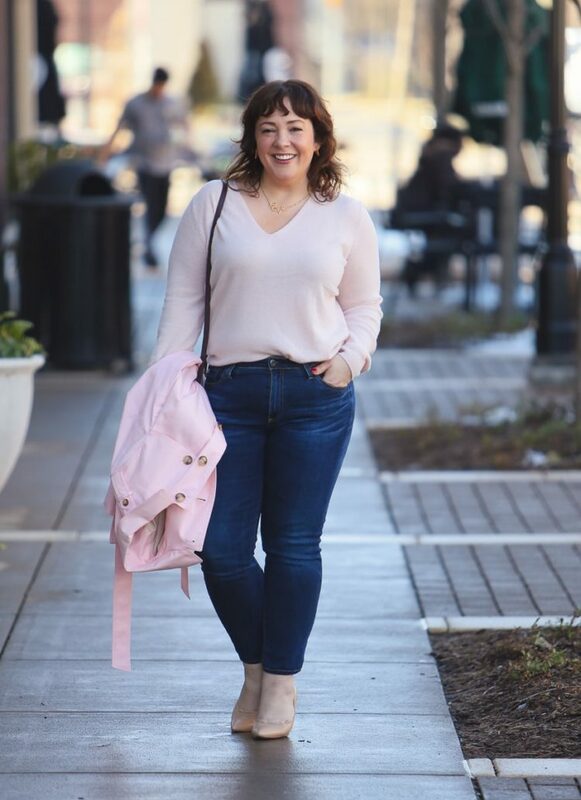 I wear these jeans every week, they're my go-to jeans but I desire something a bit higher of a waist to wear with different kinds of items, and a wash that is slightly different. Since these hit at my natural waist, I think they emphasize my lower belly with some looks, and a higher waist smooths the torso for me. I'll be honest, I haven't sought out AG Jeans again because the price doesn't fit in my budget (I'm a one pair of fancy jeans kind of gal). But these jeans… if I was told I could only keep one pair of jeans in my wardrobe these would definately be it! 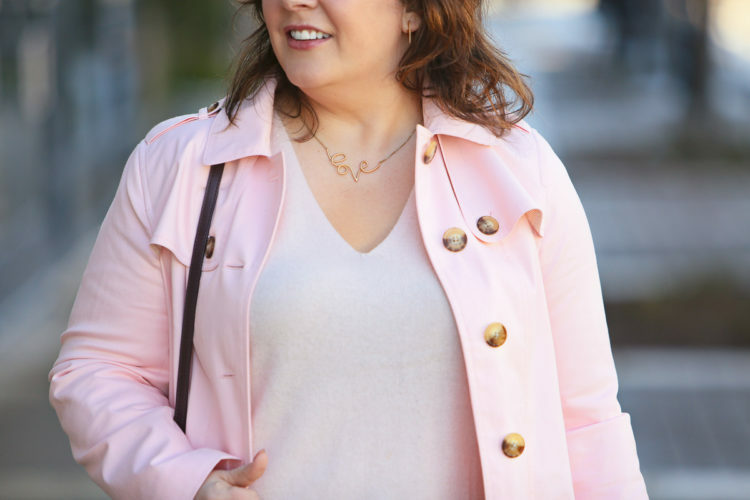 As for this blush pink trench coat… I saw it on Talbots and fell in love. I featured the yellow version of it in a blog post last month but knew I couldn't carry off the color. But this pink? Envision with a Breton tee, with white jeans, over a dress in most any color (red, hot pink, turquoise, navy, black, white, denim, yellow…). I love that it's single breasted yet very classic with the epaulets and horn buttons. I find that from March through May I wear trench coats more than any other style of jacket, but was psyched to have an unseasonably warm February day to rock it now. The lipstick doesn't make a major statement but it's why I like it. Many of you have raved about Thrive Causemetics so I placed an order for their mascara and ordered a lipstick to qualify for free shipping. I have to say it's a pretty perfect everyday color. Not too brown or too plum or too pink, it feels good, wears well, and I love how Thrive Causemetics is vegan, cruelty free, and also gives back to fellow women. I was in the car doing a touch-up before the shoot; Karl was waiting for me outside the car and took a few shots because he was bored (and encouraging me to get a move on, LOL) and this was one of them! As an FYI, Thrive Causemetics doesn't have an affiliate program. They do have a rewards program, but it's against their policy to share it on a public site like this. I am just a raving fan! Stay tuned, I'll be sharing a review of the mascara soon (spoiler alert, I love it). I live in the NYC area, so a pink trenchcoat might be too daring not only walking through crowds, sitting on the subway or getting splashed by an errant cab that could quickly stain it. 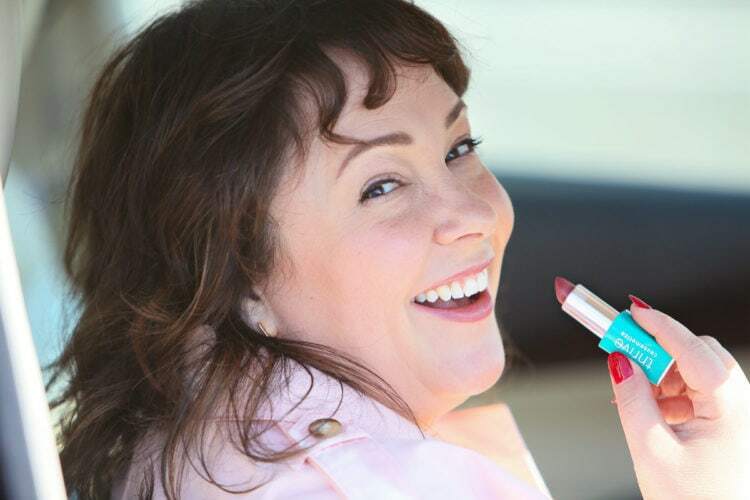 But, I liked the idea of the vegan, cruelty-free, giving back to women lipstick, so I purchased two (including Alyse and the shade you’re wearing) to try them out. I liked how they featured the colors on several different complexions so I could see how they’d look on skin colors closest to my own. I’ll let you know how they work out. The idea of a pink trench does not only sound refreshing but also looks fabulous ! I like to have a fresh coat for Spring. I commute via public transit and outerwear is a big thing for me. All you need is a fresh silk scarf and a hat. I see it’s washable — that’s a plus for light colored coat. I don’t what I brush up against but it seems like my coats are always getting grimy spots and need washing. You really do look pretty in pink! I love all the pieces you are wearing, and I am looking forward to hearing more about Thrive Causemetics. Living in Arizona, we get too little rain to justify a wardrobe with more than one raincoat. Well, I actually have one classic trench, plus several waterproof jackets for cycling or running when we have rain in the winter, which sometimes we are lucky to get. In fact, it is raining now. 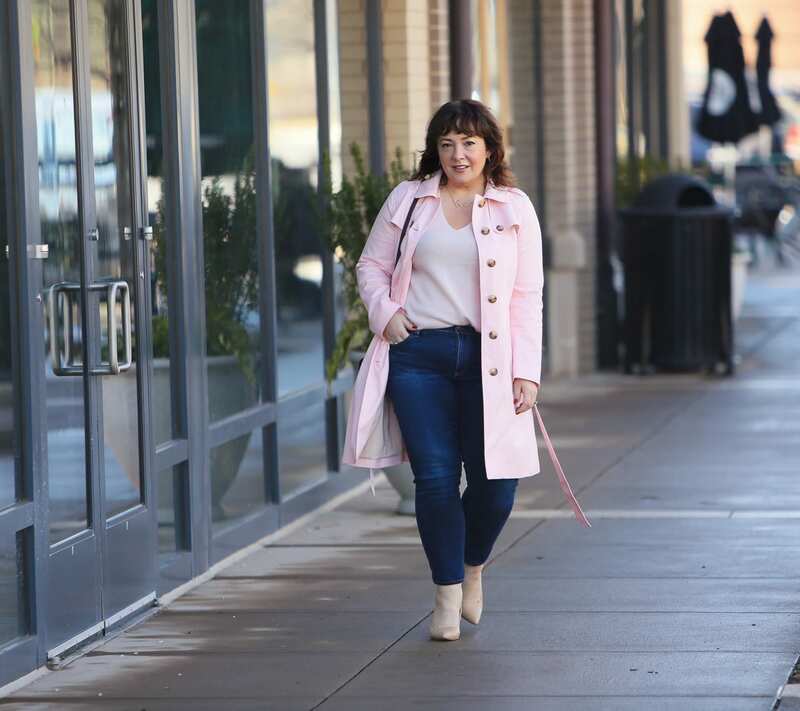 We are being blessed with a wetter than usual winter But if I lived somewhere with a “regular” sort of climate, I would love to have a pink trench for spring! I love trench coats but I struggle to wear them without looking like a bag lady. I can’t seem to pull off the look, even though it seems such a simple thing! Maybe you could do a post with different ways of styling (& tying) trench coats, and different clothing items for different looks – jeans, dresses, skirts etc. I would definitely read that post and refer back to it regularly! This reminds me of the Cabi blue trench you had last year that I had to track down and buy. The Tanner, I think? I love it! I’m laughing about you pulling out the Spring look because temps reached high 50’s. We were just laughing last night that here in Northern California, that’s when everyone starts wearing down jackets. LOL! Years ago I had a pink raincoat from Nordstrom’s. I think it’s just the thing to feel cheery on rainy days I might have to check this out. You look great in it! Thanks Melissa! And I do find a happy colored jacket is the perfect way to improve a gray day! Ironically, I recently gave my pink double-breasted Land’s End trench coat to a friend. I finally had to admit that the style didn’t suit me and that it was too snug on top, even though I wore it for years and always got lots of compliments on it. 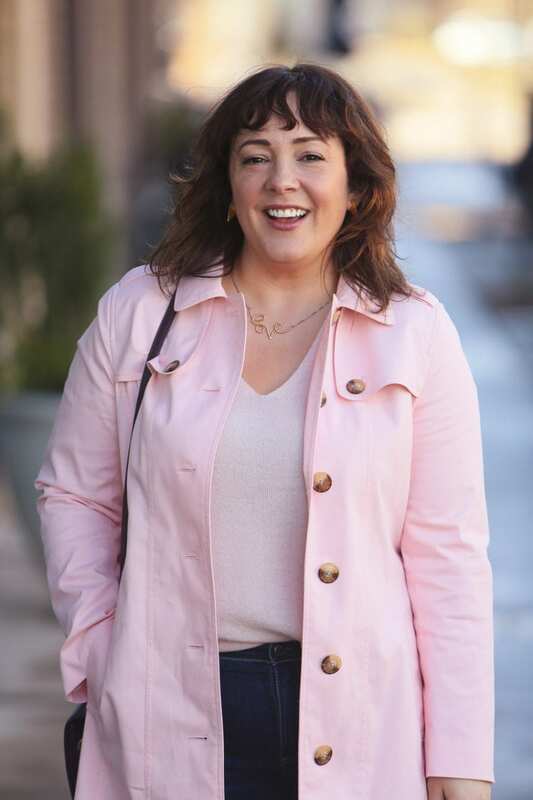 I had to laugh when I walked into Talbots and saw their pink trench coat! My friend will definitely be in style this spring! I’m a “winter” and am in search of some spring tops in my color palette. “White with a drop of color” (as described by Color Me Beautiful) is tough to find, but your pink sweater might fit the bill.